Dying Light: Kick Squad, Transform and PARKOUR OUT. It’s an unfortunate fact that creating a new IP is always fraught with danger. The wider gaming community is incredibly hard to judge and seemingly minor decisions on certain mechanics can have a huge reaching impact on how they perceive your game. There is a good chunk of this community that hungers for new and innovative content however and should you touch a nerve with them a new IP can quickly turn itself into a dynasty of its own. Dying Light is Techland’s most recent new IP, taking the lessons learned from Dead Island and using them to craft a better experience in a new world. For the most part they pull this off although the key differentiating mechanic is both its greatest and worst asset. The city of Harran is in chaos. Months ago a mysterious outbreak occurred that turned people in ravenous monsters, feasting upon the flesh of others and spreading the contagion at a rapid pace. The city was quickly walled off however, containing the spread ensuring it wouldn’t cause a worldwide apocalypse. An organization called the Global Relief Effort has been instrumental in ensuring that some semblance of order remains, appointing a man called Kadir Sulaiman to keep the peace. However a tragedy involving his brother has sent him rogue and he is threatening to release a file that could put thousands of lives at risk. 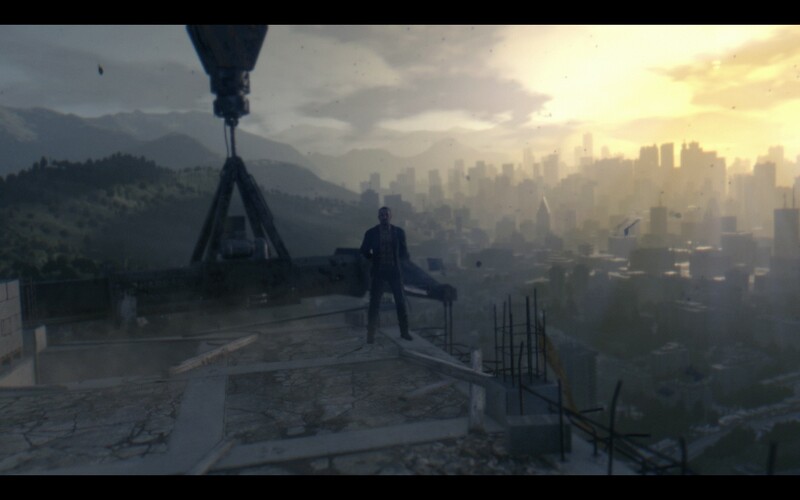 It’s up to you, Kyle Crane, to stop him and save not only the people of Harran, but the world at large. 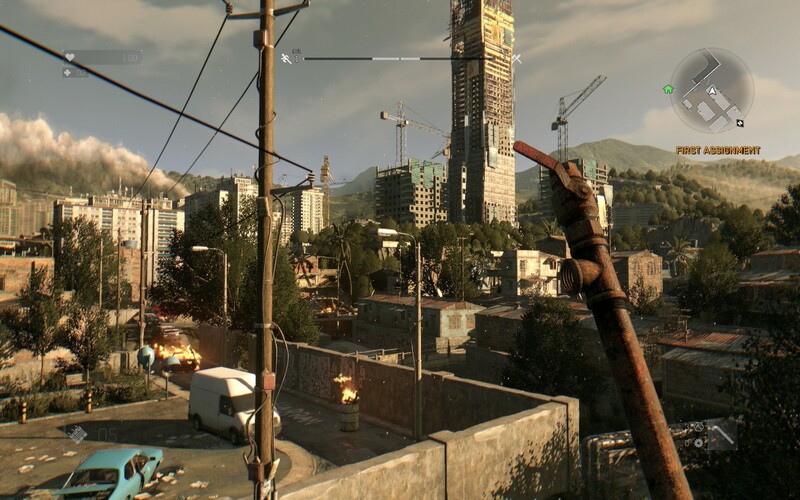 Dying Light is built on Techland’s own Chrome Engine 6 which is exclusively for PC and next gen platforms. There’s a notable step up in graphics, in everything from textures to lighting to the detail of the models, which predictably sent my rig into slideshow mode in the more action heavy sequences. It’s definitely an evolutionary step rather than a revolutionary one as it still retains the same feel that Dead Island had in terms of graphics and effects, something which I noted early on before I found out that it was the same developer. That being said the environments are much bigger and broader in scope with a lot more attention to detail given the exploration heavy nature that the game has now taken on. In a nutshell it’s a solid amount of progress for Techland and it will be very interesting to compare and contrast it against Dead Island 2 when it debuts. 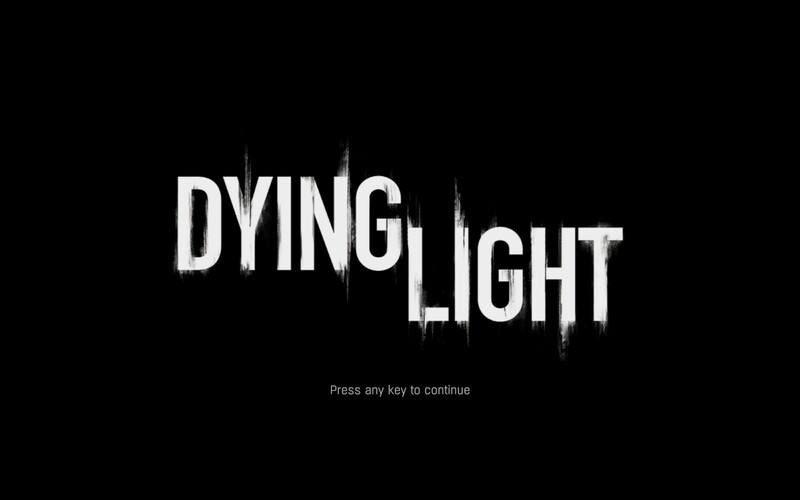 Dying Light is an open world, first person survival horror game that blends in a lot of RPG elements including talent trees and crafting. Those of you who’ve played Dead Island will find many of the mechanics to be very similar however many of them have been streamlined so you spend a lot less time diving through menus. Unlike its predecessor however Dying Light includes a heavy exploration aspect, allowing you to clamber all over everything in the world in good old fashioned parkour styling. This radically changes how the game plays out, giving you a vast array of options in how you tackle each situation. Finally you’ll engage in good old fashioned melee combat using crude tools like pipes and wrenches all the way up to fully automatic weaponry. All in all it’s best summed up as an improved version of Dead Island although some of the improvements aren’t without their drawbacks. 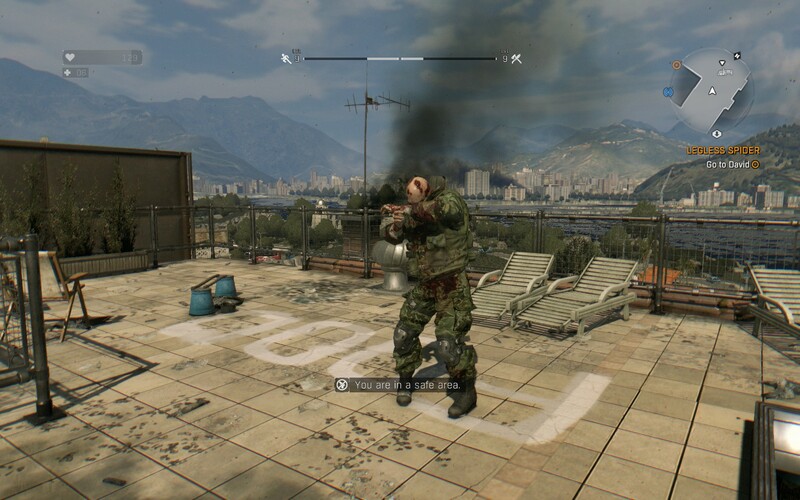 The combat in Dying Light will likely be an unique experience for everyone as there’s a huge number of combinations of weapons, modifications and talent builds that all affect how you hack and slash your way through the game. The melee aspect is the most polished although it still suffers from the trials and tribulations that is first person melee combat. Quite often you’ll find weapons (especially big 2 handed ones) not connecting like you think they should, requiring almost frame perfect timing to get them to land properly. The guns are by far the weakest aspect of the combat as they just don’t feel polished enough, especially when compared to the melee weapons. The parkour aspect allows you to alter the dynamic quite a lot, often allowing you to use the environment to gain a significant advantage. Indeed, as I alluded to earlier, the parkour/exploration aspect of Dying Light is simultaneously the best and worst aspect of the game. The good of it is that it adds a whole new layer onto the trope that Techland set up in Dead Island, significantly opening up the map to an incredible amount of exploration that is quite rewarding. There’s still a fair chunk of jumping puzzles which only have one proper solution to them but other than that you’re free to find the best angle of attack for your current challenge, something which can make the difference between a mission being a complete breeze and a total nightmare. Once you get the grappling hook upgrade it gets even better, enabling you to travel across the map at inhuman speed and get you out of jams that would’ve otherwise resulted in your death. Suffice to say the good of the parkour is really good but it’s marred by its less than stellar aspects. There are numerous points in the game where the parkour simply doesn’t flow like you’d expect to. The visual cues to what you can and can’t climb on aren’t terribly consistent and judging whether or not you can make a particular jump is more of an art than a science. Worst of all the hit detection for your character to latch onto things fails way more often than it should, often sending you plummeting to the ground with no indication of why that failed. Worse still when you do get the grappling hook it will likely be disabled with the cop out message “You’re too exhausted to use your grappling hook right now” making the upgrade worthless. These are fixable issues, and undoubtedly something that will get patched in later versions, however it doesn’t detract from the fact that some of the parkour heavy sections can be seriously frustrating. 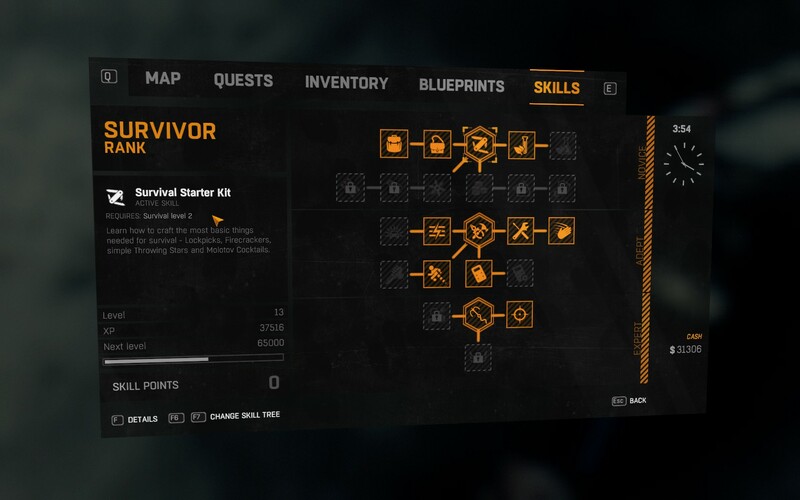 The talent system is well thought out, splitting out your character’s progression into 3 main categories: survivor, agility and power. The survivor tree is levelled up by completing objectives and gives you access to ancillary skills that will help you survive in Harran. Agility is progressed by simply moving around the world and enables you to move easier around the world. Finally the power tree is all about zombie killing, turning you from a schmuck wielding a pipe to a whirling death machine. With 3 different things to level up progression is consistent and constant, ensuring you’re never too far away from unlocking something to make you just that little bit better. Honestly though apart from the grappling hook most of the upgrades aren’t hugely impactful but after a while the sum of their parts starts to add up to something greater. The crafting system is very rewarding and retains many of the characteristics from Dead Island. All crafting reagents, bar the base weapons, can be held on your character in unlimited quantities, ensuring that you always have all your materials on you to craft things. Gone is the requirement for using a bench or other things enabling you to craft whatever you need whenever you need it. The only issue I have with the system is that weapon upgrades (not modifications) cannot be crafted and so most of your weapons will likely have their upgrade slots unused. I’m pretty sure this isn’t me missing a key mechanic in the game either as my numerous Google searches on the issue came up blank. 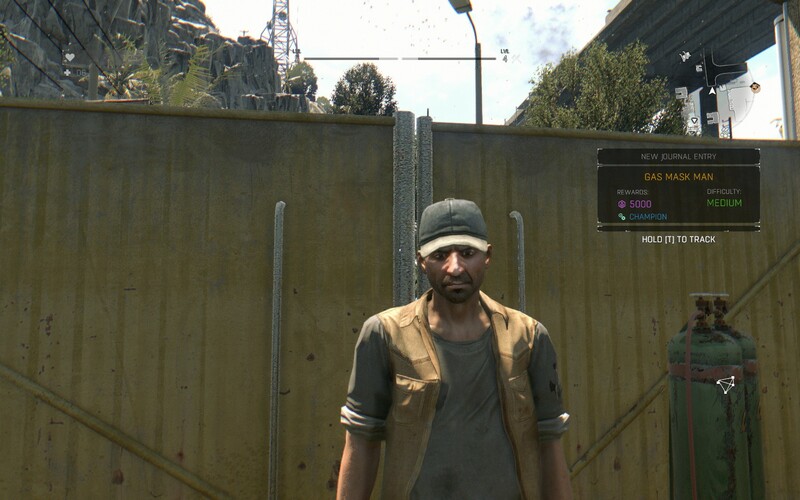 Suffice to say whilst I think the crafting system is strong in Dying Light it seems like one aspect was overlooked. Dying Light was a relatively smooth experience for me, free of any major issues like crashing or game breaking bugs. However there were numerous quirks where things happened that shouldn’t have like the picture above where my safe zone was somehow infested with zombies despite me having just cleared it out. There was also the rather unsettling thing of my character screaming, yelling or saying something random every time I loaded in which often made me think I had been dropped into the middle of combat before realising it was just him making noise for no reason. It kind of feels like a Bethesda release if I’m honest, where the core game is solid but stuff around the periphery is a little wonky and will likely take a couple patch cycles to sort out. The story feels, at best, mediocre due mostly to its predictability and pacing issues that a present throughout most of the campaign missions. Now I’m willing to admit part of this is likely due to my campaign-first playstyle for these kinds of games (putting me at least than half of total completion by the end) however I’ve played several other games that have managed to get that right without relying on side missions to flesh things out. Combine that with the obvious plot twists and highly predictable emotional climaxes and you end up with a story that’s enough to drive you along but not enough to make you empathize with the characters. Indeed it’s one of the few aspects that doesn’t improve on Dead Island at all, a right shame considering that it was one of the more heavily criticised aspects. Dying Light is a solid new IP for Techland, taking the essence of what made Dead Island great and translating that into a whole new game which stands well on its own. There’s a lot to love in Dying Light, from the parkour to the visceral combat to the crafting system that allows you to create weapons of untold destructive power. However much of the experience is marred in varying issues ranging from the fixable game play variety to the mediocre story which doesn’t add much overall. Suffice to say I still think it’s worth playing just maybe not by yourself, instead with a bunch of mates and a few beers to take the edge of the more frustating aspects. Dying Light is available on PC, PlayStation4 and XboxOne right now for $71.99, $78 and $78 respectively. Game was played on the PC with a total of 15 hours played with 46% of the achievements unlocked.